So far MHFHweb has created 18 blog entries. At MacHabitat we never stop learning! We attend quarterly networking meetings and our annual, statewide conference. We also try to get to the international conference in Georgia that happens every two years as well. Closer to home, we also take field trips, and such was the case this past August. Six staff members visited the Bend ReStore to learn the details of their successful operation, and we learned a lot. One of the challenges facing any ReStore is processing what often seems a torrent of donations. Don’t get me wrong; we always want more. But it can be a little overwhelming when there is a line of cars, trucks, and trailers, bristling with everything from a refrigerator to a set of kitchen cabinets, to a sofa, to twenty gallons of paint. And once the vehicles are unloaded and the donor receives a donation receipt, there is the work of sorting, cleaning, sometimes repairing, always pricing, and then taking the items into the store. The Bend facility showed us labor saving aids like toilet or window carts, and methods like immediate sorting, then storing until there is time to process. But for me the chief lesson may have been “The donor is more important than the donation.” What does that mean and how is the philosophy implemented? It means a primary goal is building long-term relationships in the community. No, we really don’t want a package of disposable diapers or a Mr. Coffee machine; those aren’t part of our merchandise mix. But there are times it’s best to take the items, knowing we can pass them along to City Outreach Ministries or Saint Vincent de Paul. Rarely, we’ll simply dispose of unwanted items for the convenience of our donor. It costs us some money, but the under the proper circumstances it’s the right thing to do. 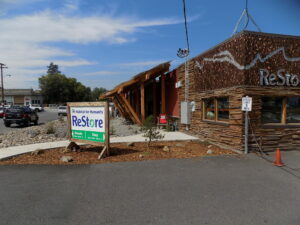 Without happy donors, there wouldn’t be a ReStore. And without ReStores, Habitat would certainly build fewer homes. Sam Fields is the newest member of our MacHabitat team. Sam comes to us as an Encore Fellow a program that matches newly retired professionals interested in community service with non-profit organizations for a 1,000 hour assignment. The Encore Fellow’s goal is to build capacity of the host agency by using professional skills. Sam will be using his vast experience with Lean Concepts and project management to help us streamline and improve the processes used at the ReStore in receiving and selling donated goods. Sam is a resident of Dayton. He proudly served twenty years in the United States Navy Submarine Service. He spent most of his time serving the country stationed on the East Coast. During his career, he received a valuable education in electronics, mechanics, pneumatics, and learned the skills necessary to be a good team player and leader. Upon his retirement in 1994, he joined Intel where he spent the next twenty-two years. While at Intel, Sam continued to learn and earned a Bachelor’s Degree in Business Management. Throughout his years in the Navy and at Intel, Sam enjoyed coaching youth sports including basketball, baseball, and football. Sam also enjoys golf, Beaver Football, kayaking, hiking, and riding his motorcycle. His favorite pastime is hanging out with his grandson, Kase. In only a few weeks, Sam has made a noticeable impact in the receiving area of the ReStore. We are excited about the potential for future improvements spearheaded by Sam. Stop by and see for yourself! Volunteers with Team Rubicon, a veteran-led non-profit disaster relief organization, conducted a “Readiness Exercise” September 16th- 18th in McMinnville at MacHabitat’s Aspire Development. The goal of the drill was to increase their ability to help homeowners impacted by events such as floods, wind storms and wildfires. This event was conducted like a disaster response operation, without the disaster, so that the volunteers could learn to be efficient and effective in helping impacted communities when a disaster does strike. The hands-on work centered around construction at our Aspire development. purpose, which is vital as many return to civilian life after more than a decade of war. The non-profit’s most recent operations in Region X (WA, OR, ID, and AK) were responses to winter flooding in northern Oregon earlier this year and to the fires in Okanogan County, WA, last year. Team Rubicon Region X is a regular partner with the McMinnville Habitat for Humanity and participates in monthly builds as a means of providing its volunteers opportunities for engagement and service between disasters. This Readiness Exercise was an extension of that partnership, benefitting both organizations. A huge thank you to our other partners on this project, First Baptist Church for their hospitality and the American Legion Post #21 for a delicious lunch and overwhelming support. Traci Spurgeon and her three children were living in substandard housing when she began her relationship with MacHabitat. Traci applied to our Homeownership Program in January 2015 and was accepted into our program in April 2015. Over the following 15 months, Traci, along with her friends and family, completed over 300 hours of sweat equity, by attending homeowner classes, working on her house, working in the ReStore, volunteering at events, and helping build her neighbors’ houses. On July 15, Traci signed her mortgage documents. The preparation and dedication of a new home is not only a testament to the hard work of the volunteers who built the house, but also to the generosity of our community partners, like Washington Roofing, who has provided free roofs to every MacHabitat home for 25 years. In preparation for move-in day, volunteers made sure the new house was spotlessly clean, Morris Carpet Cleaning generously donated their services to clean the insides and outsides of the windows, and McMinnville Grocery Outlet filled the empty cabinets for with food, spices, toiletries, and necessities – a gift they provide our new homeowners. .
We celebrated and dedicated Traci’s home on July 16 in the presence of Traci’s three children, her partner, friends, family, coworkers, community members, and volunteers and staff of MacHabitat. Traci’s employer, Harvest Fresh, donated a delicious feast and volunteers from community groups, such as First Presbyterian Church and the American Needlepoint Guild, presented gifts of their craft including hand-made quilts for each of the children and a beautiful dated ornament. Seeing the joy in the faces of this sweet family eminds us all of the power of our contributions! Thank you to everyone who was a part of making Traci’s dream of homeownership become a reality! Kurt Holmgreen started volunteering with MacHabitat in 2015; he was an out of the blue blessing He showed up in the office one day asking to volunteer and, after only one year with us, he is an integral part of our “regular crew”. When asked why he chose to volunteer with MacHabitat he said, “I have always believed in giving back to the community.” Kurt has lived a life in example of that, retiring after serving 34 years with his local fire department. Thank you for your service, Kurt. We love having you as a volunteer! MacHabitat is looking for a Construction Manager to join our fabulous team of dedicated, caring staff, volunteers, and partner families. A complete job description may be found here. 25 Years of Mac Habitat! Starla Pointer of the News Register recently interviewed Bernie Turner who is one of our founders, Joanna Engle Interim Executive Director, Shannon Carefoot our Board President, Jaye Cromwell our Community Outreach Coordinator, and Irene Fox our most recent homeowner. Click here to read the article published in the June 28, 2016 issue of the News Register. By MHFHweb|2016-07-21T15:43:25+00:00July 21st, 2016|News|Comments Off on 25 Years of Mac Habitat! We are so excited to announce that Mary Stern has joined our staff as the new Executive Director. Many of you remember Mary as our Yamhill County Commissioner from 2003 through 2014. After a two year stint in Salem, Mary is thrilled to be back contributing to her community. Read her introduction here. Tom Henderson of the News Register assisted in sharing our wonderful news. Click here to read the article published in the June 21, 2016 issue of the News Register. By MHFHweb|2016-07-21T15:41:32+00:00July 21st, 2016|News|Comments Off on Welcome Mary Stern!